Bender: My life, and by extension everyone else’s, is meaningless. The Garmin eTrex series is robust line of hand held GPS units. Designed with the outdoorsman at heart, these GPS units don’t read off turn by turn directions in a fancy British accent, so much as give you detailed accurate descriptions of where you are, where you have been, and where you are going, ensuring that your hike hits as few snags as possible. The Vista HCx is one of the higher end of the eTrex line, however, despite its bell and whistles, it still provides quick accurate results within a rugged exterior capable of serious punishment in an outdoor setting. Garmin’s Vista HCx boasts an impressive array of features. First and foremost, it packs Wide Area Augmentation System, or WAAS, which allows for quick and extremely accurate location finding, often as accurate as 3 meters or less. This sort of accuracy might seem like overkill, but when one is in the woods trying to reach a specific waypoint, or follow a GPS marked trail, the more accurate the better. With a lock on enough satellites the Vista can also calculate elevation. In addition to its quick and accurate GPS, the Vista HCx also includes a digital compass, allowing for the map to automatically orient itself to your current heading. The other pertinent details for the Vista HCx include a full color display, expandable memory through a microSD slot, and a durable rubber coated exterior. The Vista has an IPX7 water proof rating which will allow it to be completely submerged for up to half an hour, though it does not float, so if you are canoeing or kayaking attach it either to yourself or a device capable of floating such that you do not lose it. A few fringe benefits include GPS games, Sun and Moon information, Hunting Calendar plus a Barometric Altimeter. The Vista HCx makes an all around excellent hiking and outdoor GPS unit for a number of outdoor activities. Climbers and hikers will appreciate the ability to track where they are and where they are going, and the basemaps, which show major roads, mean even in an emergency you will know how to get to the nearest road to seek assistance. In the event of having to leave an injured companion, the waypoint feature will allow you to mark their exact location so that you can return to their location with minimal delay. Hunters will enjoy being able to mark better hunting grounds, and track their paths to and from. Boaters will be able to use a reliable GPS that will have no problems getting even more than a little wet. Finally, Geocachers, will be overjoyed to discover that Garmin GPS units are fully interoperable with Geochaching.com and their send to Garmin GPS feature, automatically uploading waypoints and cache information. 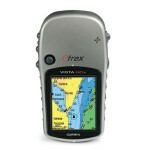 All in all, the Vista HCx is a well rounded and very capable handheld GPS that can meet any outdoor enthusiast’s needs.